The two fires affecting Ashdown Forest in East Sussex were reported to fire crews on Tuesday afternoon. Two large fires that broke out in the forest made famous by AA Milne's Winnie the Pooh novels, have now been brought under control. More than 35 hectares of woodland in Ashdown Forest in East Sussex was affected, with at least 65 firefighters tackling the blazes. Fire crews are also tackling a huge blaze on Saddleworth Moor in West Yorkshire, so big that people have described it as "apocalyptic". A large gorse fire also broke out on Arthur's Seat in Edinburgh. It comes as the UK broke the record for the warmest winter day for a second time. Firefighters battled a huge moorland fire on Saddleworth Moor, near Marsden overnight. The fire on Saddleworth Moor started at about 19:30 on Tuesday evening, and covers about 1.5 sq km of land near Marsden. 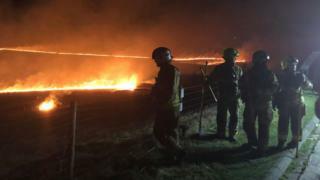 Laura Boocock, West Yorkshire Fire Service's incident commander, said it was "one of the biggest moorland fires we've ever had to deal with". No one has been injured, but five crews and two specialist moorland firefighting units stayed at the scene of the fire overnight. BBC Yorkshire climate correspondent Paul Hudson said that, like much of the UK, the region had faced unseasonal winter temperatures. These kind of temperatures, 18C or 19C, are what you would normally see in early June. "There's been a prolonged abnormally warm spell and we've also had an exceptionally dry start to 2019. The temperature on Wednesday is also set to be pretty similar." This isn't the first time Saddleworth Moor has experienced these kind of problems. In June and July last year the Army was drafted in to help Greater Manchester crews deal with a blaze on Saddleworth Moor in Tameside. Firefighters from 20 different brigades were drafted in to help tackle two huge moorland fires which burnt for several weeks. 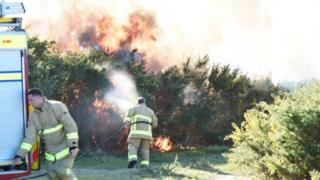 Dozens of firefighter battled through the night to extinguish a large gorse fire on Arthur's Seat in Edinburgh. 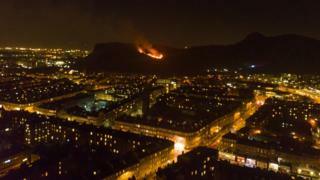 On Tuesday evening a large gorse fire broke out on Arthur's Seat in Edinburgh. The Scottish Fire and Rescue Service said they had received 197 calls about the fire, with engulfed about 800 square metres of gorse on the Salisbury Crags. Fire crews in Edinburgh have now been stood down, and there were no reports of any injuries. Climate Change is to blame. The kids on strike came just in time! what about summer? Snow!!!!?? What is up with all these warm weather fires? !